The business known to most as PB Ale House was not the first brewery at 721 Grand. First it was Terrific Pacific Brewery & Grill, then Taylor’s Restaurant & Brewery. Licenses for the location date back to 1995, making it one of the oldest breweries in town. And until recently, its brewhouse went back further than that. “It was close to 30 years old,” says head brewer Jonathon Rielly, who’s been told it pre-dated PB Ale House, originally bought from another brewery in Ontario. 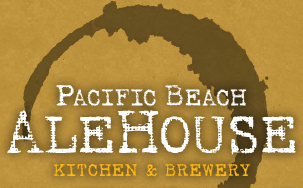 Rielly, an Oceanside native who previously brewed at Prohibition Brewery in Vista, started PB Ale House here in May 2015, not long after the President’s Day fire that forced the restaurant to shut down for half a year. Somehow, that old brewhouse survived, while everything else was destroyed. When it opened, installing a brewpub in the macro-beer capital of San Diego was a noble experiment. The sheer density of lower-cost, Big Beer-driven bars in PB, coupled with an increasing number of venues serving craft beer, has kept the community’s eponymous alehouse from gaining traction. PB Ale’s brewhouse sits on the other side of a glass wall from its main dining room, and though some electronics were damaged, its tanks remained intact, if outdated. Once the business re-opened, Rielly could be seen back there, manually stirring in grains in an open-top, 14-barrel brew vessel. In January 2018, PB Ale House updated it brew tank, installing a new Premier Stainless system that gives Rielly a chance to produce a better and more consistent product. And more efficient. Despite downsizing from a 14-barrel tank to one half its size, the new seven-barrel rig is reducing both cost of goods and brew time. While the beer quality varies, as does the beer knowledge of the staff, the venue still has its charms as well as a great upper-deck with unimpeded views of the ocean and people-watching on Grand Avenue. Monday 3-6pm: $3 house draft beer, $5 guest draft beer, $7 featured craft cocktail, 50% off wine bottles. $2 off all starters, $12.99 burger and 14 ounce beer. Tuesday 3-6pm: $3 house draft beer, $5 guest draft beer, $7 featured craft cocktail, 50% off wine bottles. $2 off all starters, $12.99 burger and 14 ounce beer. Wednesday 3-6pm: $3 house draft beer, $5 guest draft beer, $7 featured craft cocktail, 50% off wine bottles. $2 off all starters, $12.99 burger and 14 ounce beer. Thursday 3-6pm: $3 house draft beer, $5 guest draft beer, $7 featured craft cocktail, 50% off wine bottles. $2 off all starters, $12.99 burger and 14 ounce beer. Friday 3-6pm: $3 house draft beer, $5 guest draft beer, $7 featured craft cocktail, 50% off wine bottles. $2 off all starters, $12.99 burger and 14 ounce beer.